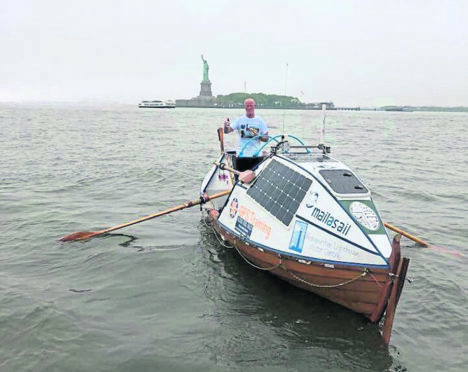 Duncan Hutchison leaving New York as he rows across the Atlantic. Duncan Hutchison raised the alarm in the early hours of Saturday morning when the electronics on the Sleipnir – his 23ft craft – started to fail about 860 miles from Land’s End. The rescue came on what was Mr Hutchison’s 100th day at sea having departed New York three months ago in his bid to become only the 15th person to complete a west to east row across the ocean. On Friday morning he started experiencing problems with a decreasing power supply and the failure of his secondary battery followed by the primary supply cutting out leaving him without GPS tracker and navigation. By 11pm he made the decision to radio for help, writing “Now I have to act before everything on my battery charge dies” and managed to contact rescue centres both in the UK and Houston. The MV Asphalt Splendir was just 40 miles away and was diverted to assist arriving just after 3am and the rough seas almost cost him his life. In waves 9–16ft high, Mr Hutchison tried to attach the heaving line but he came to within 20 feet of the merchant vessel’s huge propellers but drifted to safety when the line broke. The Sleipnir started “lurching” and he was “flung over the side underwater” hanging onto his safety wire. Another wave raised him up and he climbed on board, the surging swell then pushed the Sleipnir up and he managed to grab the rescue ladder. Despite not finishing his row Mr Hutchison still intends to donate more than £20,000 of sponsorship cash to the Water Aid charity. He is now heading back to New York with the Sleipnir in tow. 07:00 – Radio begins to fade away and eventually dies… I isolate this battery and run off primary one… electrics back working for now. 23:00 – I call my wife Marie to explain situation. I inform that I’m actually fine, but need assistance due to power issues beyond my fixing. Now I have to act before everything on my battery charge dies. 00:00 – I set off emergency beacon on Satellite phone and get through to Houston Texas services. I also make contact with UK side, all extremely helpful and calm… Called back by cargo boat M/V Asphalt Splendir 40 miles away, diverting to assist. 05:05 – Finally got heaving line. Tried to fasten and drifted down aft of vessel and for a horrible few minutes, about 20ft from big propellers, Sleipnir lunges in deep over on side. Sleipnir remains with rider, lurching away from boat and I’m flung over the side underwater hanging onto my stainless 10 safety wire… if I let go, I’m away! Calmly thinking and holding on instinctively I think of my family and push up towards my boat, staring at it’s keel. Swell goes back up and I manage to climb back in after a few attempts, then eventually a surge pushes Sleipnir up about 4m and I grab rescue ladder. I’m now off wood and onto the steel of the freight. 06:00 – Survivor on board and boat under tow to New York… again! I am well looked after, given dry clothes and a room by 2nd officer Andrejs Jermuconoks and taken to see the captain Serqej Korepin.